This blue on white 3m x 12mm fabric tape is for use with our PTH105, PTH105 Blue, PTH105 Pink, PT1290, PT2030, PT2730 and PTP700 labelling machines. 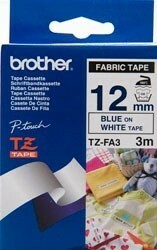 Our TZ and TZe tapes can be used to label far more than just stationery and containers. Due to their unique laminated design, these labels can withstand abrasion, chemicals, water, hot and cold temperatures, and harsh light. Unlike many consumer labels, Brother labels can be used outside, in the freezer, in the dishwasher and in the garden. They’re also the most hygienic label on the market – they can be used in labs and hospitals as well.